For our very first issue we are pleased to have Mike Harris from Canyons in Minakami. One of the more famous foreigners in Minakami with his strong New Zealand accent and the bright red dreadlocks. 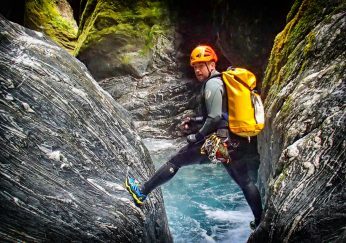 Mike speaks fluent Japanese and has appeared on several television shows promoting canyoning. We did this interview with him just as he is getting ready for the 2013 summer season. Mike first came to Japan from New Zealand on an exchange program to study Japanese in 1992 while at university. After short time here working in gas stations in Shikoku he then returned to New Zealand to finish university. Forward a few year to 1994, Mike returned to Japan and headed up to the ski fields of Hakuba and heard about Minakami for the first time. After a brief jaunt to Tokyo, Mike came up to Minakami in spring 1995 to start rafting with one of the first New Zealand rafting companies in the area. Mike was trained by some of the top New Zealand rafting guides and kept on learning rafting both back in New Zealand and Australia to gain an ever better experience from different river types. From here, he has pretty much stayed ever since. While working for the rafting company and building the business there were times during the low river season when rafting was not possible. 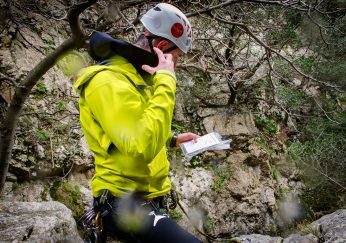 Mike started to offer some basic technical canyoning courses with him and his mates for the first time to test the market. One of the first canyon routes was Nishi Kuro and Tengoku in Fujiwara. The reaction of the customers was amazing. There was a potential for canyoning to increase in Japan so one of the most important things was to get certification. Looking around on the Internet in those days, I came across Rich Carlson from the American Canyoneers Association. Spending a month in the Arizona desert I went through all the training that was on offer. Returning from America I soon started the Kusatsu canyon course with a new partner. During this time, myself and another partner were pretty much managing all the canyoning in Minakami. We were running this all out of a small garage but it was just getting too much to handle, so after some time I made the decision to move to a new base in the mountains and consolidated all the canyoning. Canyons officially started in 1997 and was then incorporated in 2003. The current base of canyons is an old company recreation house for Bosch power tools. Acquired back in 2007 it formed the ideal location and perfect space for hosting Canyons in. Initially the building was more like a hospital with green tiles, but with help from a few friends they milled down some local trees and reshaped the building in to what it is today. Being in nature and in water has been a part of Mikes life ever since he was a kid. Although originally a rafting guide canyoning is something that is more special to him. 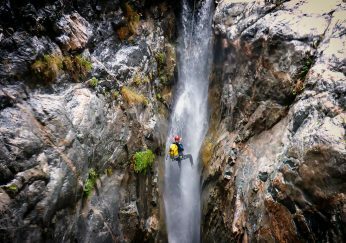 How did you discover Canyoning? In 1996, I went to Nepal as an expedition raft guide and first discovered canyoning. They started the first ever canyon trips around Nepal by Nepalese climbing guides and then with the French canyoners later on. Over time on each canyoning trip I learnt the tools of the trade and bolting various courses. 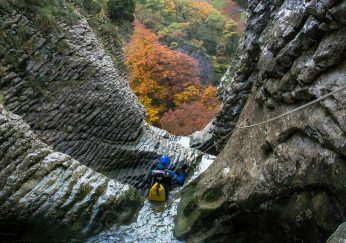 When I realised that there must be canyons like this in Japan that would make a great summer time adventure sport, in 1997 I returned to Minakami to seek out canyons and areas to apply this new craft. 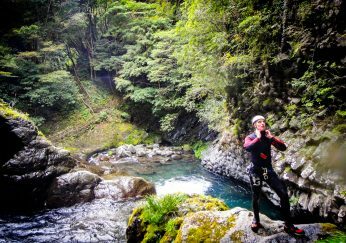 What is the state of Canyoning in Japan and its future? 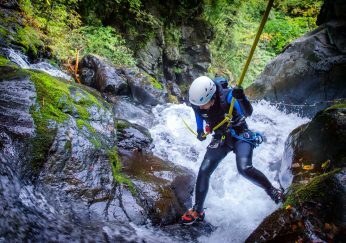 There has been increase in the number companies offering canyoning in Japan and whether this is sustainable remains to be seen. 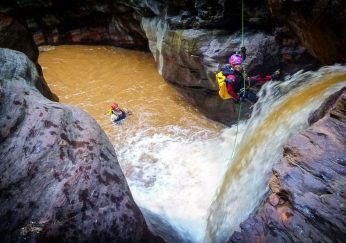 One of the problems with canyoning is over crowding of areas as some other companies have offered the same routes as everyone else without finding new routes for themselves. If people create new courses in new areas then that will be sustainable. If everyone does the same routes as everyone else, then this will put more stress on the environment as well as the community. For example Fox Canyon in Minakami, which is busiest canyon in the world, about 400 people a day go down this canyon. There needs to some more rules. Not only related to quality issues but more often safety issues needs to be addressed. Some areas like Fox which is in the middle of the town, there is very little environmental impact but in some other areas, there needs to be some guidelines placed to make sure the environment is protected and sustained. 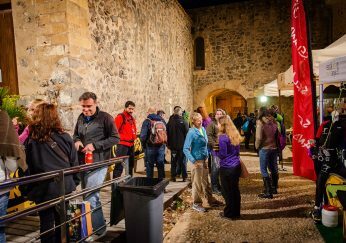 How important is Certification in Canyoning Industry? For the growth of the industry, it is very important to have all the guides certified but even more important to constant and consistent training. For the protection of the industry and sustainability of the industry certification is a necessary requirement. Inevitable people will have accidents, and people can have accidents any time but you need something to back you up. If you have had official training and certification and its kept up to date if gives you from both a legal standpoint and a social standpoint of showing of credibility. For the growth of industry, certification is a way forwards. For governmental officials in Japan, having certification proves that you are a professional operator and have acted in the correct manner. The certification should be world recognised. A certification shouldn’t be a based on personal experience. You should be able to show that your certification is accepted around the world and is endorsed by many organisations around the world. Recreational canyoning has not really taking off like in other parts of the world. Will it ever? It’s only a matter of time before it hits big like it has overseas. One of things that is holding it off is that there isn’t many courses or information out there at the moment and this is where Canyon Magazine will help grow the sport in Japan. There are many repeaters so teaching these people more about canyoning will able them to enter the canyons themselves. Over the next years we will see more positive and negative issues. The positive is that more people come aware of aware of the sport and learn more about it but the negative side is that without some sort of training, there could be issue with accidents or more importantly canyon manners and etiquette where descending a canyon or access a canyon without permission could cause problems with the local councils. For example, Caving in Japan, where canyoning has its roots from, used to be very popular in Japan some time ago, but with access issues and accidents caused the local councils to close over 80% of the caves without access. But with good regulations and good etiquette this should help promote canyoning as good recreational sport. When going through canyons and canyon areas sometime I have come across people doing canyoning but usually with strange techniques or some strange items such as trailer rope they bought from the local hardware store. 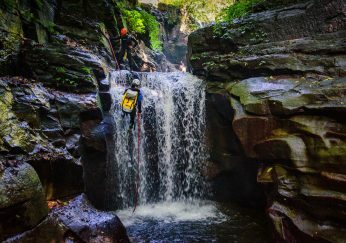 With better information out there available to public it can only help improve the understanding of canyoning. The biggest thing is definitely regulation but also resource approval as well. If you are using an area for canyoning you should seek approval so that an area does not come over populated or over run.. There shouldn’t be 50 companies just using one course. If a company wants to come in and do canyoning they should look at finding a new course. Safety, Quality & Nature are the 3 points that regulation and approval should cover. As well as this guide certification and keeping up with certification is essential. Having consistent training, knowledge transfer, operational guidelines as well as best practice for both guides and operators so that the industry can have a good standard that protects the public. Canyon areas around the world sometimes have restrictions. What are some of the issues in Japan? Firstly it would be Waterfalls. Waterfalls sometimes have significant features such as a tourist attraction or they could have a spiritual meaning associated with them. Each area has their own understanding about waterfalls and some also have bad connotations associated with them. So you must confirm with the local people if it is acceptable to abseil or jump of a waterfall. City councils are risk averse so with any new area is going to be and uphill battle to convince people in what you are doing is reasonably safe. It’s hard for authorities to hear that what you are doing is not 100% but in the majority of things we do, you can never guarantee 100%. Public access rights and private land access should be sought and respected. Abseiling down a waterfall next to an outdoor bath is not a good look so some common sense is required. Compared to overseas, it is fairly open at the moment but as before if you don’t respect the canyons and the locals it could get all closed off. You’ve been canyoning around the world, apart from Japan where about are you favourite canyons? New Zealand of course. Other places are the Reunion Islands in the Indian Ocean, I would love to do. But generally New Zealand still holds some amazing canyons to go and see. In the North Part of the island, there are semi tropical canyons that end up on beaches. Then down on the South Island you have the big and cold canyons which still have more to be discovered. You also have access to volcanic canyons which are completely different. This is what makes New Zealand unique for canyoning. Different types over small area. Just started a vegetarian diet about a month before this interview so looking back, its would be BBQ. Anything that goes on a BBQ be it Ribs, Chicken etc. Favourite Drink a power shake , spirulina, bananas, soy milk and honey. Apart from that it would be beer. Apart from Canyoning what do you get up to on the weekends or time off? Spend time with my kids. I take my kids mountain biking, rock climbing and of course canyoning. Anything outdoors.